The All On 4 Implant Procedure,Replacing all your Teeth on 4 Implants ! Get the revolutionary All-on-4 dental implant technique and replace a whole arch of teeth in less than a day! All-on-4/6’s are a teeth replacement system that refers to ‘all’ the teeth in either the upper or lower jaw being replaced with a bridge supported by either ‘four’ or ‘six’ dental implants. The dental implants are inserted into the jaw bone, eventually integrating with the bone in a process called osseointegration. Once this has happened, the implant provides strong, sturdy support for false teeth – either a single crown or multiple teeth in a bridge. Patients with bone loss who cannot have traditional implants without undergoing a bone graft procedure. Those wishing for an alternative solution to traditional dentures or removable implant dentures. People looking for a long-term remedy to the problem of multiple missing and badly decayed teeth. People looking for a pocket-friendly alternative for Full Jaw Implant-supported fixed teeth. What is the procedure for All-on-4/6’s? 1: Assessment : Your dentist will conduct a thorough examination, taking X-rays and Scans to assess the anatomical structures in your mouth and the extent (if any) of bone loss. If you are suitable for the All-on-4/6 procedure, study model impressions will be made of your mouth to send to the Laboratory who will manufacture your new teeth. 2: Treatment Day: The procedure can be carried out under intravenous sedation along with local anaesthetic. It typically takes around 2 hours per jaw. Any extractions needed can be done at the same time. 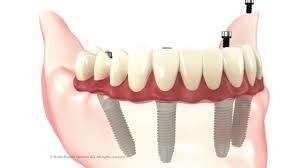 The dental implants will be inserted into the jaw. 3: A provisional set of teeth will be placed within 24-72 hours making it aesthetically pleasing for the patient as well as giving time for dental tissues to heal. 4: Final teeth Fix: Permanent set of teeth is fixed approximately after 3-6 months once the implants and the gums completely mature.